Author and illustrator Roger Duvoisin (1900–1980) was a Swiss artist who immigrated to the United States in the late 1920s. He published over 40 of his own books and collaborated with several writers on even more. He won the Caldecott Medal in 1948 and again in 1966. 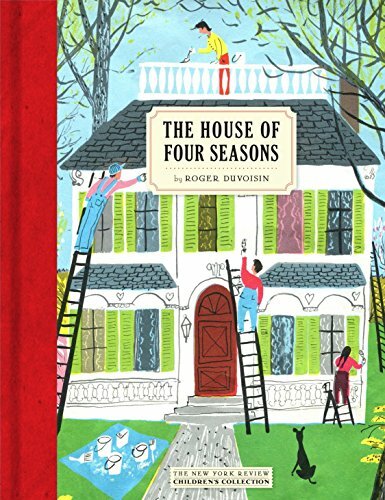 The House of Four Seasons is one of many in his prestigious collection. Set in quaint and innocent mid-1950s America (the book was originally published in 1956), the illustrations are riddled with hints of this bygone era. Father is presented smoking a pipe; Mother is almost always in a dress even when cleaning the house, rolling snow balls in the winter and gardening in the yard; of course the children are named Billy and Suzy; Father is driving them all to the country in a super modern 1956 Packard Wagon! This car is not all Father is driving. He is actually driving the plot of this story as well. The family comes upon a nice big house on a picture perfect lot they would like to buy. The house is in a dreary and bedraggled state and needs a lift. Sub-contractors are assigned most of the renovation projects but Father thinks it would be fun for the family to paint the entire exterior of the house together. Here, on page six, is where the conflict begins: the family disagrees on what paint color to choose. Suzy wants a red house with green shutters, the colors for springtime. Billy prefers a yellow house with purple shutters perfect for summer. Mother chimes in with a brown house and blue shutters to round out the fall. And Father votes for the winter colors of green and orange. What is a family to do? Which season do they choose? Paint all of the colors like a big bedding quilt? Paint each side a different combination? Adding to the conundrum is that the woefully old-fashioned hardware store only sells red, yellow, and blue paint colors. But never fear, Father is here to teach us what happens when primary colors are mixed into secondary colors and all of the sudden we have every color we could want. He does not stop with mixing pigments. Industrious Father makes a spin toy to demonstrate how to bring about the “color” white. He explains that white is really all of the colors and white would make their house a House for all Four Seasons. So it is all settled. They paint a white house with green shutters and live happily ever after. While there is, in general, nothing offensive about this story, it is very much out dated in its sentiment. A children’s story lead by Father lecturing is not as compelling as a children’s story of discovery lead by child protagonists. Billy and Suzy are certainly school aged and could easily have been the heroes. In this sense the story mimics the traditional roles of 1950s with Father generously allowing Mother, Billy, and Suzy a vote, but not really allowing them much more. Even in Father’s body language with his everpresent pipe and his haughty “look at me, kids” stance when demonstrating yellow paint, he expects his kids to awe and revere his genius. Another downside is the misleading assumption that white is a blend of all the colors. Well, it is and it isn’t and this is not handled well in the story. Father is teaching that if all the paint colors are blended together, white will appear. And this is just not the case. In paint, white is the absence of color and it’s impossible to create it from color. However, in light, white is the blending of all the colors, which is why the spin toy works, and incidentally, why rainbows exist. If this story really wanted to teach about colors, it should have made a point that the spin toy was demonstrating color as light while the mixing of primary colors was demonstrating color as pigments. A final pet peeve is that even the illustrations don’t draw out the colors very well. The color palette is primarily primary—red, yellow, and green—but not pure, and problems are obvious in the way the colors were reproduced during the printing process. Green, orange, and purple are very hard to discern and prove lackluster on pages that are meant to showcase these amazing colors. The outcome of Father’s color demonstration is not very impressive. What does carry over from the 1950s to 2017 is the focus on working together as a family. Ultimately this family succeeds in creating a nice home in the country that they will enjoy through every season of the year for years to come.